When I was asked to come up with a casual picture to share with readers I finally settled on one with my dog. 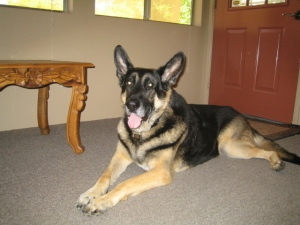 He was the third of three German Shepherds that I was privileged to share my life with. In the last years of his life he was my constant writing companion. The support a dog can give you is like no other as I’m sure many of you know. A dog started me on my journey and then each one helped me continue. I wouldn’t feel right if he wasn’t represented too. So it is only fitting that he is there beside me as I enter this world of writers and readers and offer my contribution, We Are The Destroyers. Amazon and Barnes & Noble. Click here to purchase the book. Click here to read an excerpt from We Are The Destroyers.